Viewing time: 4 mins. and 52 secs. The Write Question is a weekly video podcast all about writing. Today’s question focuses on writing book introductions…. Welcome to The Write Question, I’m Daphne Gray-Grant. Today we’re talking about how to write a book introduction. Today I’m answering a question from science teacher and writer Fred Estes in San Francisco. Here’s his question. [phone recording] Hi Daphne, I’m writing a book of biographical profiles about contemporary teenage scientists and inventors. To inspire and engage middle and high school students, I want to showcase young people inventing and making discoveries NOW as well as reveal a bit about how they do it. The introduction is a quandary for me. What are the essential elements and structure for a book like mine? How long should it be? How do I captivate potential readers? Thanks. Thanks for the questions, Fred. I just rewrote the introduction to next book so your question is very timely for me. I’m a big believer in NOT re-inventing the wheel. Whenever I’m faced with questions like the ones you’ve asked, I always go to see what others have done. If I admire the work of another writer, I figure they’ve left a good model for me. Willpower by Roy Baumeister and John Tierney. Talent is Overrated by Geoff Colvin. After a quick look, I noticed that I could divide the authors into two groups: (a) Those who treated the introduction as just another chapter in the book vs. (b) those who made it a short, fairly informal salutation. Notice I’m not saying that one approach is better than the other. That would make no more sense than saying that tomato is better than tomAYto. Both are correct. In the case of introductions, the important decision is to choose one and be consistent. After examining the four books more closely, I decided I wanted to take the informal approach with my own manuscript. In terms of “essential elements,” most introductions will give the reader some idea of WHY the author wrote the book and a brief summary of what it contains. Other than that, I don’t think there’s anything that’s intrinsic. To address the question of length, I also calculated the word count of the introductions of each of the four books. I didn’t have a PDF of any of them, where I could have done a word count automatically, so, instead, I counted the number of words on ONE page and then multiplied that by the total number of pages in the introduction. The two books that treated the intro as just another chapter were both significantly longer. Baumeister’s intro chapter was roughly 6,200 words and Colvin’s was roughly 5,000. The two books that adopted the more informal style were really quite brief. Brown’s was just over 1,000 words and Kawasaki’s was about 1,300. Good news for me! Writing my intro chapter wasn’t going to take nearly as much time as I thought. My goal became 1,200, so short it nearly wrote itself. But, rather than just follow MY advice, I think it’s likely better for you to select four to six books that are somewhat similar to the one you’re writing. Every genre has its own rules and practices. Once you look at those books, I’m sure you’ll learn all sorts of useful information and perhaps you’ll discover some unspoken rules that I failed to discern myself. There is never any downside to finding a good model and copying it. I’ve posted a link below to a blog I wrote on that topic. As for how to captivate your readers, I think that relates to your writing style. Is it lively? Is it interesting? Do you use lots of active, persuasive verbs? 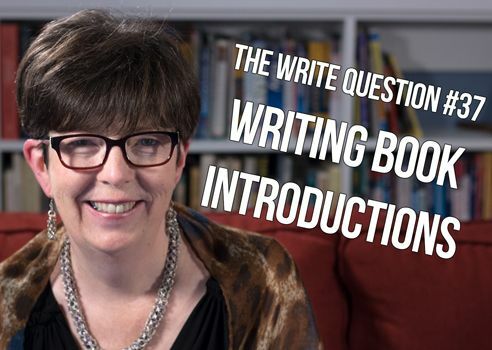 The job of writing an introduction is not all that different from writing the rest of your book. Yes, the chapter must fulfill a certain role — it needs to sketch out the purpose of your book — but once you’ve done that, simply apply the same rules you use for any other chapter. Thanks for your question, Fred. I know you’re smart enough to make sure you won’t bore, Boris Karloff.